For the past 25 years, Bruce R. Rothschild, DDS has provided gentle and compassionate services as a local dentist in Pearl River NY. Discover for yourself why so many people make him their choice for their dental needs. People often have quite a few questions about their dental care, different family and cosmetic services, and a variety of dental conditions. 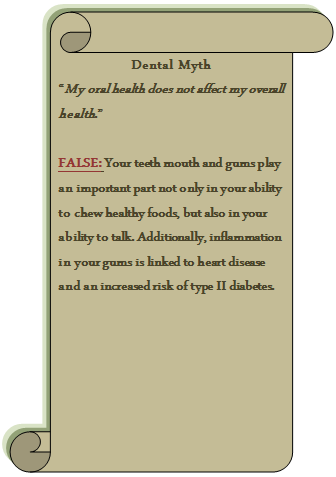 Often they have misconceptions about what to expect from a local family dentist because of several common dental myths. As a service to the local community, Dr. Rothschild and his staff have put together this list of common questions along with their answers. Question: My teeth look and feel fine. Why does everyone tell me I still need to see a dentist? Answer: While brushing and flossing go a long way to keeping your teeth and gums healthy, regular dental checkup identify small problems, like small pockets of decay or early signs of gum disease. Regular dental cleanings remove hard deposits called calculus, which only can be removed by special instruments used by our dental hygienists. It is also helpful to have an established relationship with a local dentist in Pearl River NY in case you or a family member has a dental emergency. Question: There is a lot of information on the Internet about fluoride being dangerous. Is it true? Answer: The small amount of fluoride that is in toothpaste and drinking water is not only safe, but it is also beneficial as it prevents as much as 25 percent of tooth decay, according to the American Dental Association. In fact, the ADA just released a statement recommending the use of fluoride toothpaste in young children as soon as their first tooth breaks through their gums. If you have more questions and want to speak to a local family dentist in Pearl River NY, contact Dr. Bruce L Rothschild & Associates, P.L.L.C. at 845-623-0305.